Working at height is a routine part of the daily job in many operations. 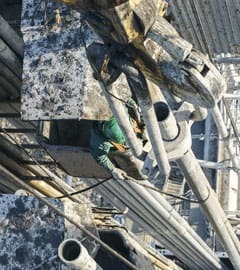 Not only when erecting buildings or process plants, but also on oil platforms, in mines, when cleaning building facades, carrying out repair or maintenance works on electricity pylons; there are many places where people have to do their job at heights and have to protect themselves against falls. Not always it is possible to have technical fall protection like handrails or barriers – even though this would guarantee high-level protection. For many of these tasks the use of personal fall arrest equipment is the only solution and therefore unavoidable. Almost without exception falls lead to severe injuries – or even fatalities. A fall from an apparently low height without fall arrest protection can result in hospitalisation and very often leads to long lasting consequences. Worse still, more than one third of all fatal work accidents in Germany in 2014 were due to falls from height. That means that almost every working day somebody died from a fall from height. This sadly is also the case in other countries. Our human senses help us to perceive height as a risk. Fear of heights or a feeling of dizziness are natural indicators for a high risk of falling. One could be mistaken for thinking that this would be sufficient to let us instinctively behave in a safe way and to do everything necessary to come back to the ground without any injury. Unfortunately, however, the reality is much more complex and complicated. Safe behaviour at heights demands expert knowledge which needs to be studied. This list alone shows that organisation and cooperation of many experts is needed in order to provide sustainable protection for colleagues working at height. Safety engineers have this expertise, but repeatedly face the challenge of how to provide it to the employees at the right time. The next question we must ask is how to get the necessary knowledge to those who have to apply it for their own safety. In daily practice we often experience boring and unemotional instruction sessions. Often these are teaching monologues, even though we know that with this kind of training method very little information is captured by even the most motivated listener. If we had to sell our products we would never make use of such an unengaging format to share information; or if we did we would surely disappear from the market quite quickly. Anyhow, this method is employed frequently, especially when talking about the health and safety of our colleagues or employees. Why would we do that – even against better knowledge? Using such an uninspired format, we will surely become lost in a viciously cyclical rhythm of under motivated employees and lack lustre trainers? Knowledge is important, but human actions are largely driven by experience rather than knowledge. Overexposure normalises virtually any trait: whether you’re considering graphic violence, endless vain consumerism or dangerous work at height. Routine makes us lose our perception of the risks of a fall. The more we get used to working at height the less we can rely on our natural instincts, since we feel more and more safe and relaxed when working even in high altitudes. It is at this point that the risk of falling increases exponentially. Upon attaining an inner feeling of safety, workers have been known to shun protective measures. After all, they’ve worn it until now and never fallen, so why bother with the hassle of putting it on in the first place? Once you’ve carried out one risky behaviour without immediate consequence, it’s a slippery slope to a highly misplaced feeling of invincibility. The result of our subjective risk perception differs more and more from the objective risk assessment result. Finally, we even get the feeling that our protective equipment is hindering us from working effectively. This is when the challenge for leaders and experts starts. How do we make those at risk of injury at height understand and accept the importance of the protective measures? Training and safety instruction on a regular basis are necessary to let expertise and knowledge be the drivers of employees’ actions, rather than being led by personal experience that no accidents have happened for years. So how then do we make safety training efficient? It’s simple: be inspiring, not boring! Most individuals are intelligent enough to understand that safety equipment is necessary. So let’s take the people seriously and ask for their opinion, their improvement suggestions and their ideas on how to realise them. We like being involved and taken seriously. This should also be practised in safety instruction and training, instead of just reading out loud and repeating what most of the employees – according to their seniority at work – will have heard many times before. So let’s turn the tables and ask them: how can you do your task in a safe way? And what do you need for that? In this way we take them seriously for what they are: experts in their workplace and experts in their own protection. In this respect motivation towards convinced safe action is the goal of safety instruction, rather than the pure transfer of information. Let us challenge the employees and invite them to think outside the box. In order to achieve this, we should lead our safety instructions with questions. By engaging with a group and opening up debates, those in training will reflect and enter into a dialogue about safety. Any training or instruction should end with an unambiguous commitment towards the safe behaviour of all involved colleagues. Try it and see if your safety instruction evolves into interesting and inspiring discussions about safety. Importantly, remember that safety doesn’t end in the classroom. After your training session walk the talk, checking to see whether the discussed measures are really being applied on the shop floor. Then whatever the outcome, stay engaged with those under your instruction and continue the safety dialogue. The involvement of the leader is the pinnacle for every safety instruction. The real importance of a topic is shown by the active engagement of the leader in it. The easiest way to demonstrate this is to be present in the safety training and to sit in the first row. Even more impressive and efficient commitment is shown when making safety a leadership concern. Active contribution of the leader in the safety instruction can make safety an important and obvious topic. By giving small yet clearly visible signs, the importance of the right protection measures can be influenced proactively. A leader opening the instruction session with motivating words shows the importance of the topic, and asking for a clear commitment at the end has more power than even the best expert’s lecture on its own. Talking about possible improvement of safety measures should be as natural as the daily checks of product quality, production output and cost reduction. How you approach safety is your choice. Make it an important issue by making it your own. By engage the workforce in safety training employees are more likely to not only feel valued, but also to internalise the safety messages, resulting in a happier and safer workplace for everyone. Dr Volker Koch holds a PhD in Chemistry from the Leibnitz University in Hannover and is the General Manager at etalon international GmbH.